Dendrobium densiflorum has won the popular vote for Orchid of the Year 2017 – thanks to all of you that voted. 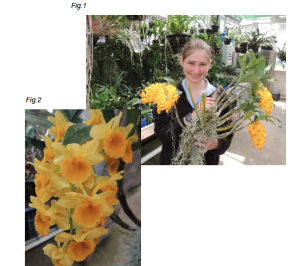 In honour of its victory I have reproduced an article written about the species in 2013 by student Zoe Barnes (then in year 11) that formed part of her group’s entry into the National Science and Engineering competition which they Won. Zoe is currently studying a degree in Environmental Science at Plymouth University and with her new commercial diving certificate is about to embark on Kelp research which she has promised to share on this website. I am Zoe Barnes, a 16 year old student at Writhlington School. I am involved in the Writhlington Orchid Project where I am in charge of the Orchid Propagation Laboratory. 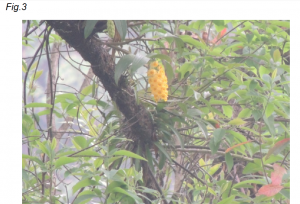 Fig.3 shows one of the plants of Dendrobium densiflorum that I discovered in flower while in Sikkim. I found this at 1000m above sea level on a steep wooded slope. This photo is taken from the road side and that impressive epiphyte can be found close to main roads in Sikkim. There is no moss on the tree around the plant but it is growing quite close to other epiphytic orchids including other Dendrobiums, Eria species and Bulbophylums. 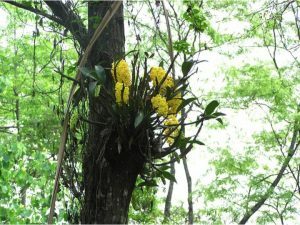 I observed it was growing on the side of the thick branches of tall trees, with the roots spreading along the branches. The forest was open evergreen woodland alowing plenty of light to reach the Orchids. 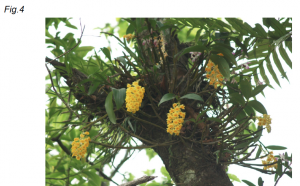 I travelled to Sikkim in April, which is at the beginning of the flowering time for Dendrobium densiflorum. This is why in the picture above there are some flowers fully out and others still in bud. This orchid has a faint and subtle smell. I couldn’t decide on my own what it smelt of, however after asking a selection of staff at Writhlington school the most common suggestions are; melon, honey and daffodils. People said it was a sweet smell and reminded them of spring time. The Writhlington Orchid Project has visited this part of Sikkim before fig.4 is a plant in a similar area to where I found them. As you can see the flowers are fully open as it was about two weeks later in the year. It was found in the same open evergreen forest and it is growing on the thick initial branches of a tall tree, similar to the ones that I discovered. 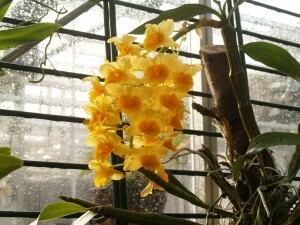 To grow Dendrobium densiflorum successfully at Writhlington we try to replicate Sikkim’s seasonal climate and provide a warm wet summer (minimum 18°) and a cooler dryer winter (minimum 12°). We grow plants both mounted on bark and planted in baskets giving good drainage. We water heavily from May through to September but water plants infrequently during the rest of the year. Dendrobium densiflorum is an amazing orchid to research and to see in the wild. Its shape is memorable and links well to its common name, which also helps it stick in your mind. Once you have seen Dendrobium densiflorum in the wild, you will never forget its dense spray of stunning flowers glowing out through the green of the forest.